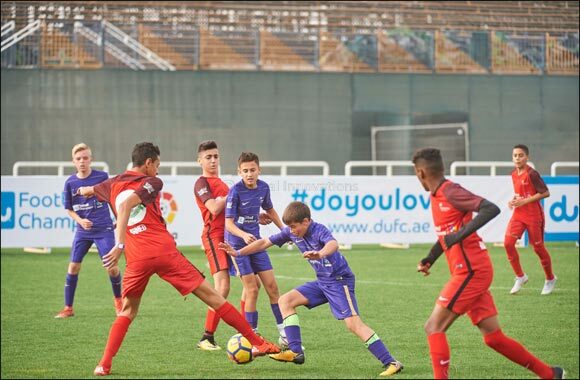 Dubai, UAE – March 25, 2019 – The nation’s greatest youth football teams claimed their winning titles yesterday at du Football Champions, in partnership with LaLiga, and home of the official UAE Schools Cup, Street Cup and UAE Girls Challenge. du Football Champions Season 4 drew to a close following a day of intense matches between Abu Dhabi, Sharjah, Al Ain and Dubai’s best teams in front of a stadium of ardent supporters at The Sevens. Each match displayed professional-level football amid fierce competition. The Finals of the award-winning du Football Champions was attended by senior officials from du, LaLiga, the Sports Councils, Ministry of Education and the UAE Schools Sports Association. While the top youth football teams across the nation met for the final time this season for the chance to be crowned the best team of the nation, LaLiga coaches were on the lookout for exceptional talents who will be selected to join the du LaLiga High Performance Centre U12, U14, U16 and U18 teams. These teams will then be invited to attend the all-expenses paid LaLiga Summer Scouting Camp in Spain in August where they will play friendlies against top LaLiga youth clubs in Spain. During this camp they will be exposed to scouts from the clubs and similarly to past years, top players are expected to be offered trial opportunities. Fans were treated to excellent football in the UAE Schools Cup Boys U12 category between rival schools The International School of Choueifat and Dubai English Speaking College (DESC). Regulation time ended nil-nil followed by a penalty shoot-out. Choueifat claimed the title with a narrow 3-2 win. The tide turned quickly for DESC though as they followed up on this loss with 2 straight wins in U14 against Sharjah’s Al Maarifa and U16 against Hatta’s Rashid Bin Saeed. Theirs was not the only dream to come true. Finally, and after four years of trying, Boys U18 Al Maarifa International Private School from Sharjah, crushed Fareeq Al Marhoum Ahmed with a 6-2 win securing them as Champions of the du Football Champions Boys U18 category. During the first part of the day, the UAE Streets Cup’s Abu Dhabi’s Dragon Academy netted 4 goals to 1 against Stallions from Sharjah. Down one player, Al Ain City still managed to win 1–0 against Dubai’s Baki II. The UAE Girls Challenge LaLiga Valencia took an early lead holding on to it for a final 3-1 win against Dubai City F.C. Stay connected via du Talents, the Middle East’s 1st Digital Scouting Talent Platform allowing footballers to be discovered.